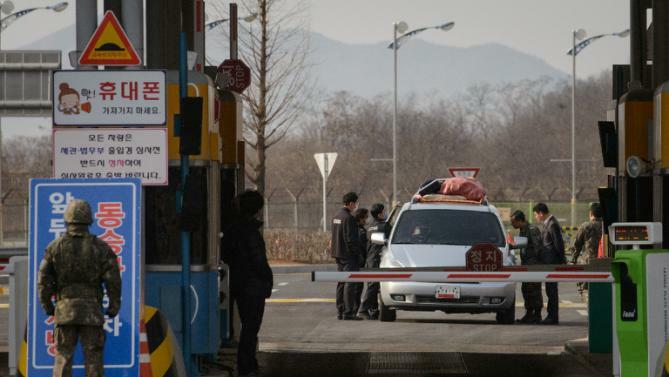 South Korea is shutting down its operations in the Kaesong industrial park jointly run by the two Koreas. On February 10, South Korea announced it would suspend its activity there because of North Korea’s recent rocket launch. Seoul had already restricted some South Korean activity there following Pyongyang’s nuclear test in January. It is unclear how long the shutdown will last, which Seoul said was aimed at cutting off money North Korea used for nuclear and missile development. About 124 mostly South Korean companies operate in Kaesong employing thousands of North Koreans. The companies operating in Kaesong have started taking out easily-moveable equipment and stocks of finished goods and raw materials. Many North Korean workers failed to turn up for work on February 11. Their South Korean managers cleared their desks and started to leave. Opened in 2004, the Kaesong complex is the only point of co-operation between South Korea and North Korea. In April 2013, North Korea shut down the complex for more than four months, after heightened tensions sparked by military drills by Seoul and Washington. The current shutdown came as the US Senate voted unanimously in favor of tougher sanctions against North Korea. The draft legislation targets any person or entity trading or financing anything related to weapons of mass destruction, conventional arms proliferation, North Korea’s rocket program, money laundering, narcotics trafficking, human rights abuses, activities that threaten US cyber security, and the import of luxury goods. Republican Senator Cory Gardner, one of the authors of the latest sanctions bill, criticized President Barack Obama’s policy of “strategic patience”. “The situation in the Korea peninsula is at its most unstable point since the armistice,” he said, referring to the deal to end hostilities in the Korean War in 1953. Republican senators and presidential candidates Ted Cruz and Marco Rubio interrupted campaigning to go back to Washington DC for the vote. Democratic candidate Bernie Sanders did not return, although he did express his support for the bill in a statement.